Trust in a brand can’t be built overnight. It takes years to become known and even longer to be trusted. In 1981, over 35 years ago, Speedglas released the first auto darkening welding helmet ever and has consistently continued to set the benchmark ever since. While other products and brands (and their spare parts) have come and gone, the Speedglas brand, guided by welders, has continued to drive innovation and lead from the front. The flagship Speedglas 9100 Welding Helmet Series has reached legendary status within the welding industry featuring product innovations like the Speedglas 9100 FX Air and the Speedglas 9100 MP. Below we take some time to look at what makes this welding helmet series from Sweden so unique. If you don’t have the time, simply skim the subheadings and only read what you don’t know already. They say it takes 10,000 hours of focus to master a skill. That’s a little over a year. The team at 3M Speedglas have been developing welding helmets for over 35 years and it’s all they do. As in, they don’t focus on anything else. This is an important point because the welding lens, harness and helmet design are conceived together, as one. They are not sourced separately from multiple points and sold under a different brand name. The benefit of this process is that you have experts designing your welding safety equipment from start to finish to the highest possible quality standards and the way each component interacts with another has been developed to optimise your comfort and performance. You’re only as strong as your weakest link. Therefore, it makes sense to spend the time and invest in the technology necessary to minimise the number of links and ensure they are of the highest quality. All Speedglas 9100 auto darkening welding lenses have custom designed multi-function programmed logic chips that minimise the number of discrete surface-mounted components. This technology leads to improved reliability and has been a key factor in building the Speedglas brand’s reputation for manufacturing quality and reliable products. By skipping these crucial steps manufacturers can avoid cost, but at what cost to the welder? Without a doubt, the most talked about feature of the Speedglas 9100 Series is Speedglas True-View technology. 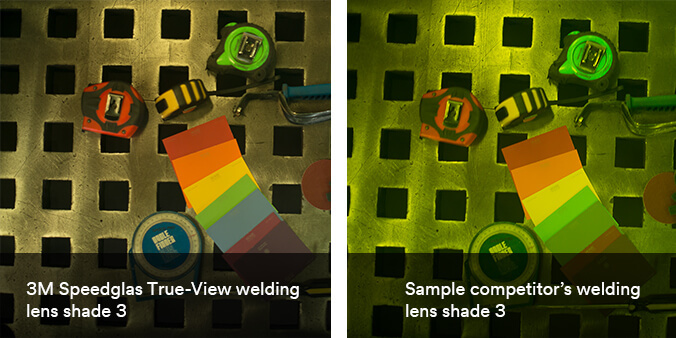 True-View has changed the way welders see their welds by allowing a broader spectrum of visible light to pass through the welding lens while still providing UV/IR protection, meaning welders can now see more colour and contrast in every weld. The greater amount of colour (more blue and red) allows for a more realistic view and a shift away from the traditional ‘green’ auto-darkening welding lenses. There is only one “Speedglas TrueView” so be sure to compare the vision looking through each welding lens, not what you read in product literature. The Speedglas 9100XXi welding lens has the most powerful arc detection on the market. Contrary to popular belief, it is irrelevant the number of photo-sensors an auto-darkening welding helmet has provided they consistently detect the welding arc. The question, therefore, is not how many sensors does the helmet have, but rather how sensitive is the lens? Speedglas 9100 welding equipment is rated for use down to an industry leading 1 amp. If detection of the arc and reliable switching is important to you, make sure to compare welding helmets on this metric. The Speedglas 9100 series has one of the largest welding lens viewing areas available on the welding safety equipment market at an impressive 73x107mm. This is 85% larger than a standard sized Speedglas lens and almost 35% bigger than most of the largest competitor viewing areas. When the peripheral viewing area of the 9100 series SideWindows is added, it gives you an even greater view of your weld! Often an overlooked feature, the light shade is a key consideration if good visibility is important to you. The darker the light shade the worse your vision will be when setting up, inspecting, grinding or moving around your workpiece. Small differences in this metric can make a large difference. The Speedglas 9100 shade 3 light state with Speedglas TrueView gives the welder high definition optical clarity. 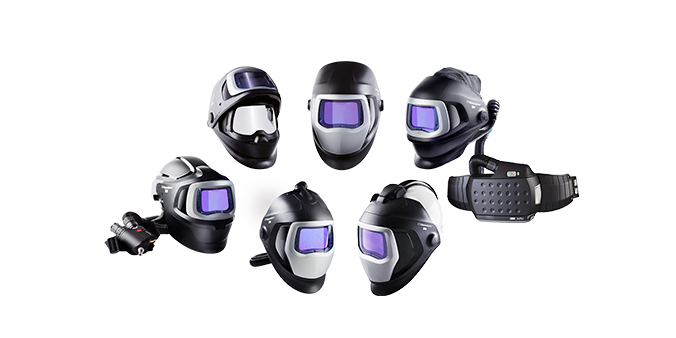 There are six welding helmet platforms within the Speedglas 9100 welding helmet series to choose from and all use the exact same auto-darkening welding lens. This means that If you don't need respiratory protection right now, you can always upgrade at a later stage using the exact same Speedglas 9100XXi welding lens. An auto-darkening welding helmet with external grind and memory mode today, a welding shield with a flip-up high impact grinding visor, safety helmet and powered or supplied air welding respirator system tomorrow. Speedglas is a long-term welding equipment investment for professional welders with one of the longest warranty periods on the market. AWS has been the sole agent for the 3M Speedglas brand in Australia and New Zealand for over 20 years and in this time has built a Speedglas support network of over 300 distributor outlets. The majority of these stores stock all the current Speedglas spare parts. AWS still stocks and sells spare parts for the Speedglas 9000 series which was released in 1996. This is a testament to the quality and longevity of the Speedglas products and a testament to the AWS support that you receive when you own a Speedglas helmet.